Last night’s hidden design cakes were highly original but unfortunately you didn’t get to see all of them. I can tell you the ones they left out were equally spectacular and it’s just such a pity that a visually impressive challenge with 5 hours work per baker got so little airtime. But such is Bake Off….we never know what we’re going to get. Squirrel with an attitude anyone? 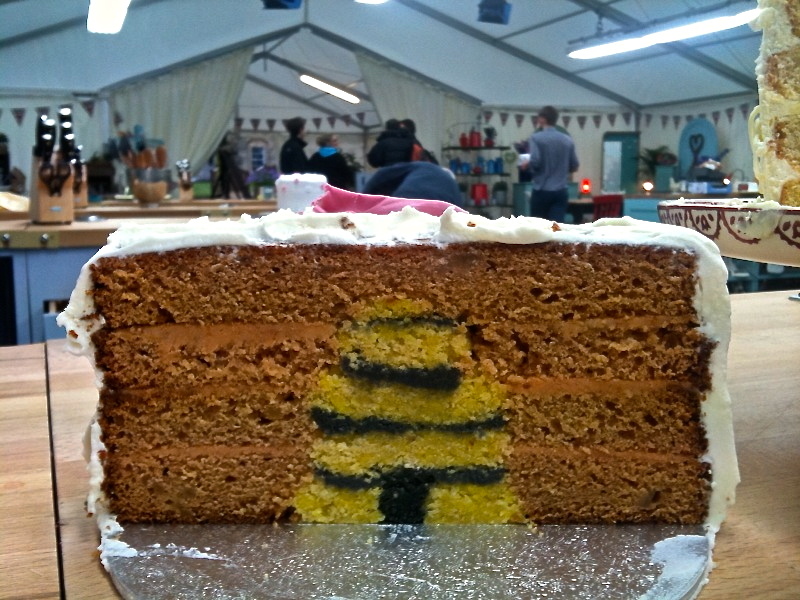 The recipe for my cake is on the BBC website here as nectar cake with hidden beehive. And here’s the inside view you’re aiming for if you want to have a go (yes it is taken from inside the tent after Mr Hollywood had wielded the knife). So some added back story to the hidden designs and how I came up with mine. The recipe request came in some time ago, and the concept was still pretty new in this country so we were sent a couple of US weblinks to help us gain some idea of what we were trying to create. 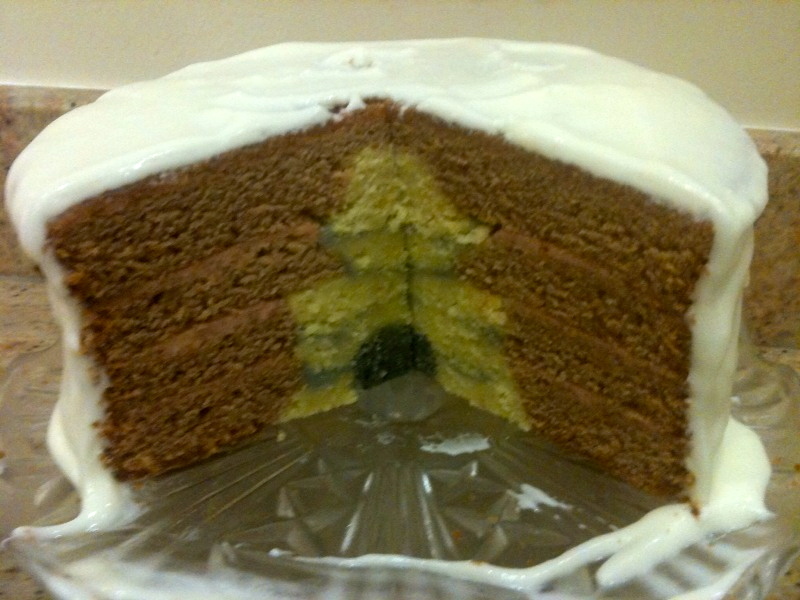 Here is the most well known site to date dealing with hidden designs- heart cake. I think all the bakers have taken those embryonic website ideas and really moved them on. I expect lots of cake clubs up and down the country will be trying hidden designs now, plus the odd professional cake maker will be including it as part of their range. In true Bake Off tradition it is just as important that the cake tastes as good as it looks and so I was disappointed with the US links. The emphasis seemed to be mainly on using the cake as a building block rather than thinking about good tasting cake. One website post even suggested just buying plain cake from the supermarket and then colouring and carving it! That’s going to get past Mary and Paul- not. So I tried to think of a unifying theme that linked the flavour of the cake with the decoration and the hidden design. 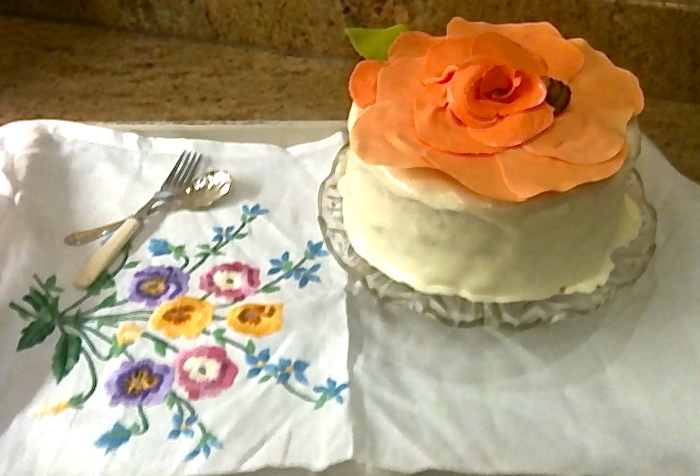 I started with the honey nectar cake, a variant of which I made for my mother’s birthday cake last year and which everyone loved. I knew it was a rich cake and as it’s made by the melting method it would produce a sponge cake firm enough for me to carve into. 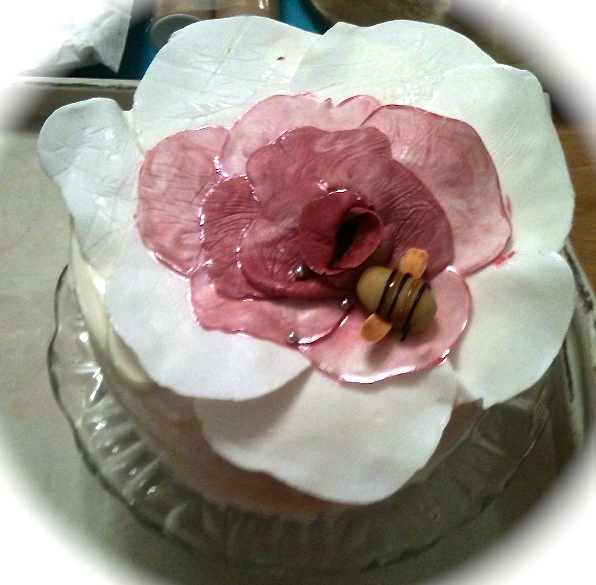 From there it made sense to decorate it with the same honey cream cheese frosting and add a large flower on the top with a marzipan bee going into it. The idea was that decoration would be relatively quick but effective. 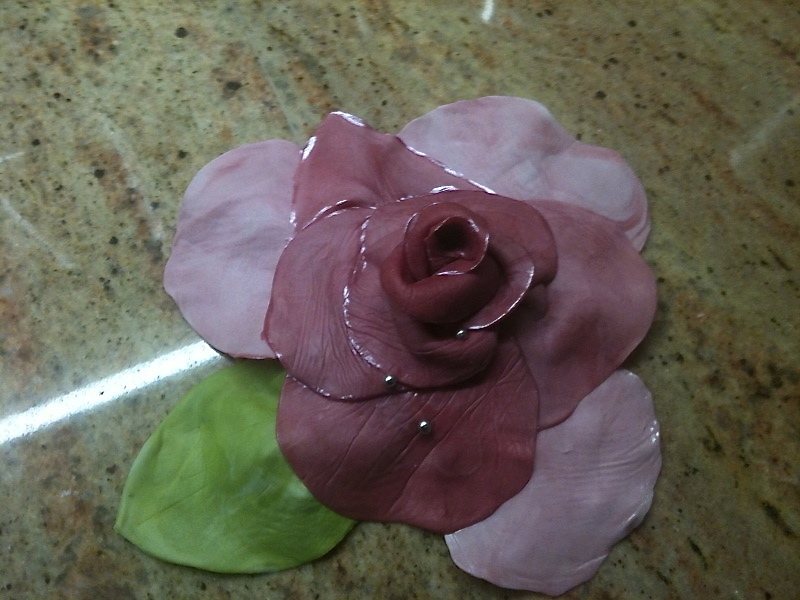 Neither of those decorations I’d ever made before but after some practice using fondant sugar paste (too thick and not delicate enough) I found some modelling paste designed for making flowers which my local cake decorating shop taught me how to use. Then it was just a case of playing out some variants of colour and style. The final product looked like a paler pink variant of this one. The bee ought to have been simple but I stuck the flaked almonds in the wrong place at the first attempt and ended up with a mouse. Second attempt was a bit better. From there I decided I would go for a beehive centrally so it looked like the bee was taking nectar back to the hive. That meant I was having to colour cake and layer it in smaller concentric circles to get the hive, using biscuit cutters as a guide for the circles. First go ended up more pagoda than hive. Making the hive lighter meant I had to make a cake that produced a crumb light in colour and texture so I chose a genoise and flavoured it with almond. The effect when it’s mixed with the buttercream and packed into the centre is a bit like a cake version of marzipan and gives 2 flavours and sorts of cake. I know it’s a crime against cake to bake and shred a perfect genoise but that’s what I did- although Paul and Mary inspected it first to make sure I wasn’t destroying the evidence. So there it is. The story behind one of the hidden design cakes you didn’t see last night but which is probably confusing people on the BBC website. If you or a friend fancy making it from that recipe, send them a link to this blog so that at least they have half an idea where to go. Plus they get a good giggle at my mistakes along the way. How to serve it? Well it’s rich, so in small portions. To paraphrase Nigella it will easily serve 12- or 1 person with a broken heart and tray to take up to bed. 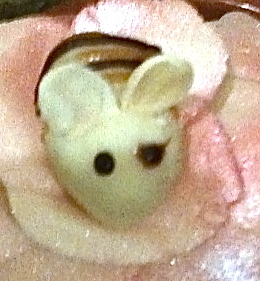 This entry was posted in GBBO and tagged cake, hidden design, honey nectar cake, tips. Bookmark the permalink. At least people now have an idea. I knew it had gone down well with the judges at the time, as I was asked for the recipe to be revised for publication, but it was a shame that they published the recipe with no picture to help as it is complicated. It’s the sort of thing that drives me mad when I’m trying to make something new and the length of the recipe alone might put people off. Anyway good luck with devising your own challenge when you get round to it. It’s not something I’d have attempted without a picture first so I’m glad you posted the photo. Such a great idea to combine those flavours with that decoration (both inside and outside) – what a pity it didn’t get any airtime. Looking forward to seeing more on GBBO and on your blog! I looked at the recipe on the bbc website but as you say, there was no picture which led me to find your blog! Would love to try this recipe as it looks beautiful and I feel encouraged now I can see what it looks like! Oh good I’m glad you found it. Hope you enjoy making and eating it. No worries Katy- glad you found the post. It is a pity that after 5 hours baking not all the cakes were shown. Brendan and Manisha have both posted photos of their cakes via their twitter accounts so you can see those too. Thanks for taking the time to drop by and leave a comment. Good luck with your own baking challenges.